This is our 15-week program for the new mom. We believe in healing, and we believe in honoring our bodies throughout the journey. This is our strength and conditioning postpartum training program for all births- vaginal or cesarean. The program starts with breath work and body awareness. Then, integrates breath and awareness together through innate motor patterns (those movement patterns we are designed for as humans). And finally, we add a bit of load or increase the volume or try some dynamic movement. All throughout this postpartum journey we are tuning into our bodies and asking for and accepting support as needed. This is the one-of-a-kind BIRTHFIT Postpartum Program. Take on the world post-delivery with daily inspiration, education, breath & movement. This is the postpartum rehab that is missing in our society. This program is meant to recalibrate and set a solid foundation of sustainable, efficient movement for the rest of your life. This program consists of three sessions per week, for fifteen weeks (a total of 45 sessions). Each session includes Warm Up, Strength, Conditioning, Accessory Work. Content is accompanied by BIRTHFIT videos, explaining and demonstrating points of performance along the way. We recommend training every other day (Monday-Wednesday-Friday or Tuesday-Thursday-Saturday). After you have read the session content, watched the videos, and performed the exercises, don't forget to post your experiences, thoughts, frustrations and encouragements in the comments below the training content to connect with our community other new mamas on the same journey. *Optional; technically everything is optional, but this is a strength and conditioning program for the transition into gym, specific sport, every day life, and beyond. *Everyone (including you) should be doing elevated pushups at this stage in their postpartum. Today we go overhead with an empty barbell. It is super important that you pay attention to your posture in the front rack position AND when the barbell is overhead with your arms locked out. The load should be directly above your head and ears. Your ears directly above your shoulders. Your ribcage should be stacked on top of your pelvis. Focus on your posture, breath, and continued alignment. Set a clock for 30 minutes. You are rotating between three movements, one movement per minute. The first minute is 6 dumbbell strict presses. Choose a load that you are 100% confident that you will nail the quality of all 6 strict presses each round (5-30lbs each). The second minute is 8 postpartum box squats. And the third minute is 20 banded face pulls. Use very light weight for the dumbbell roll backs and a mini band for tricep extensions. For one payment, you will gain access to our entire postpartum program. This ideal for anyone that has a baby in the last two years. 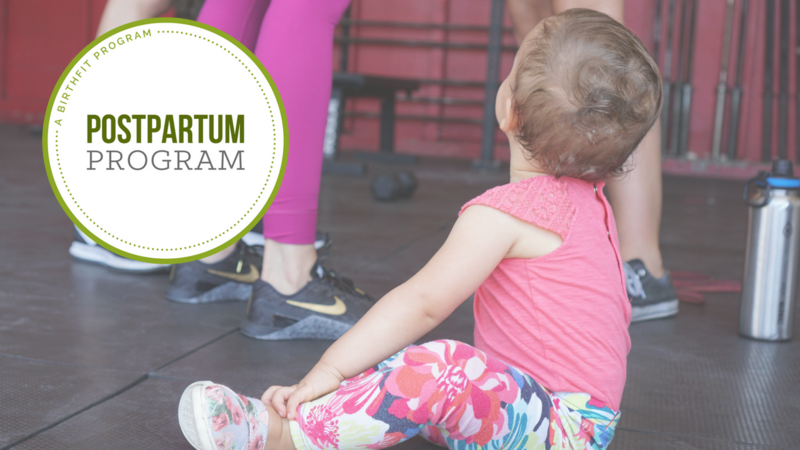 Our program starts with breath work and baby wearing and evolves into basic functional movement patterns and finally into basic power lifting movements and more. This is intentional rehab and strength training designed to meet mom where she is at and guide her to the next evolution of herself.